A ligature is the substitution of a group of glyphs by a another glyph, for aesthetic or linguistic reasons. In Fontself Maker you can create ligature glyphs as intuitively as for any character. The OpenType specifications define several kinds of ligatures to cover the needs of all languages across the world. 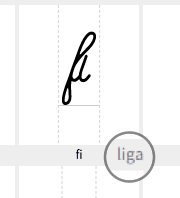 As for Latin-based languages, which are supported by Fontself Maker for now, there are still multiple kinds of ligatures (liga for standard ligatures, dlig for discretionary, hlig for historical clig for contextual, rlig for required). dlig: discretionary ligatures (for unusual type of connections, or even specific words). They are displayed only if user enables them. The way to do that depends on each app (see below). Before creation your first ligature, you must keep in mind that since a ligature is a substitution of multiple glyphs by a single glyph, all the single characters that compose your ligature must preexist in your font before you create the ligature. For instance to create the fi ligature, your font must already have glyphs for both f and i. 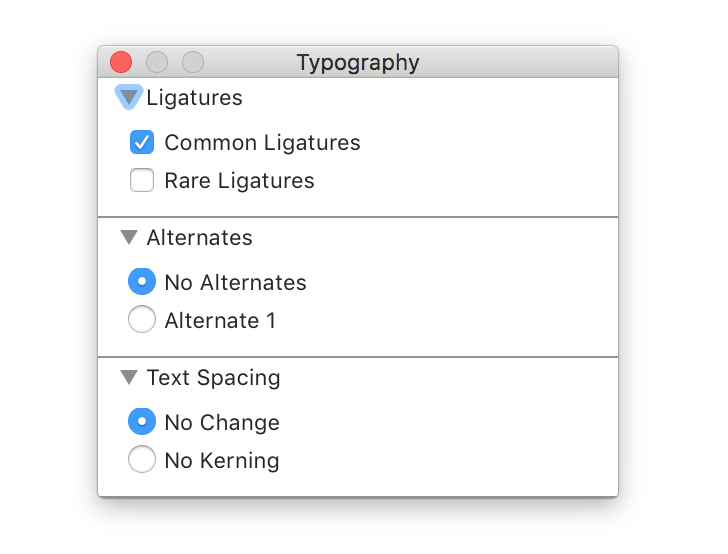 Individually, by pressing the Create Ligature button (first select your ligature shape, then type all of its letters in the text field Type any character). Fontself Maker will ask you for the type of ligature you want. 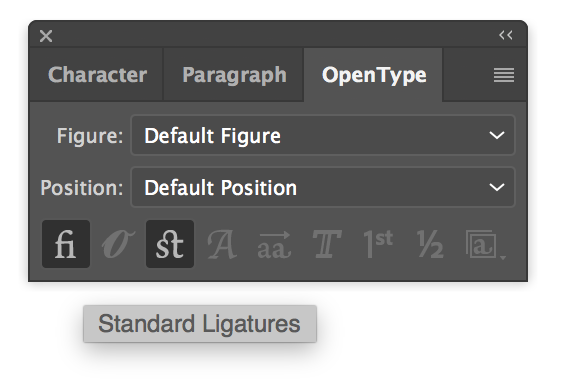 Or you can simply rename an existing glyph into a ligature in the Fontself panel. In your glyph table, each glyph cell shows at the bottom right the current type of ligature (liga or dlig ). Just click on it to change this type if you need. Adobe apps let you enable or disable your ligatures via dedicated panels. 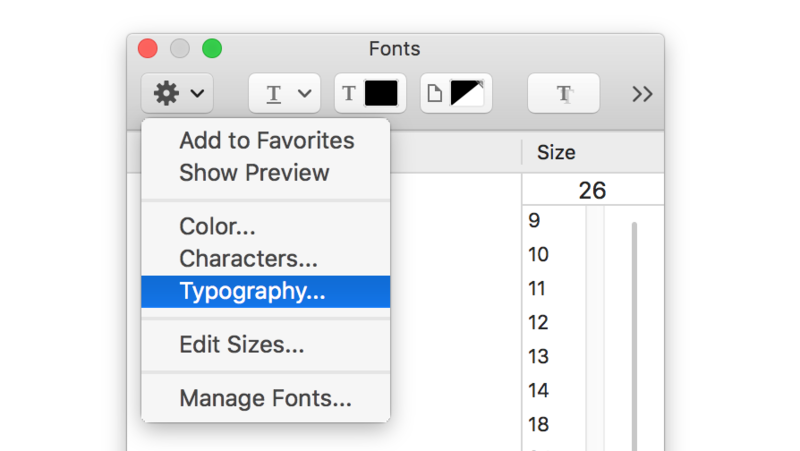 Illustrator proposes an OpenType panel via Window > Type > OpenType. Just remember to select the whole text (or just a text selection) before you click on one of these icons. On Photoshop, you have to use the Character Panel via Window > Character. Same thing in InDesign via the Character panel (click on top right menu). 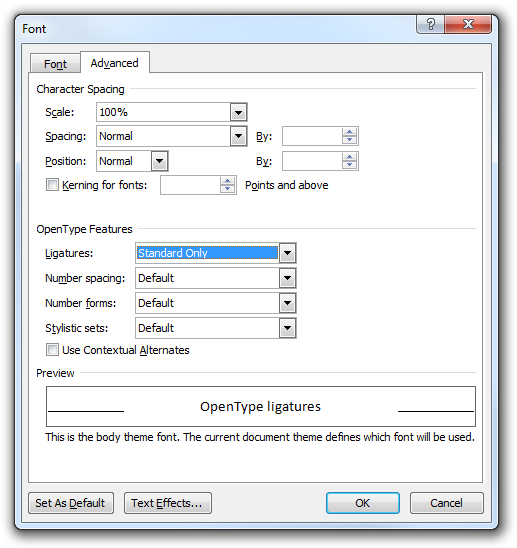 Microsoft Windows apps generally propose a Font menu by right-clicking on a selected text. This Font menu lets you setup several font features, in particular ligatures. Got any issues when using ligatures? Check this article.